A barcode reader is a hand-held input device used to capture and read information converted in a barcode. With the help of scanner, a decoder and a cable, barcode reader can translate information to a computer and it is connected to a computer through a serial port, keyboard port, or an interface device called a wedge. The reader translates the reflected light into digital data that is transferred to a computer for immediate action or storage. 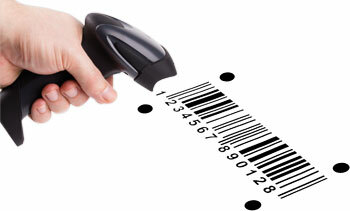 There are two types of barcodes – linear and 2D. The most visually recognizable is a linear barcode made up of two parts: the barcode and the 12-digit UPC number. In contrast, a 2D barcode is more complex and can include more information in the code : price, quantity, web address or image. A barcode type is a protocol for arranging the bars and spaces that make up a particular kind of barcode. Two – Dimensional Barcodes (2D). Barcodes represents data in the widths/lines. On base of spacing between parallel lines such as Code128, Code 39, and UPC are referred to as Linear or 1D (one – dimensional) barcode symbology. 2D barcode types hold much more data than linear barcodes. 2-Dimensional symbols are generally square or rectangular patterns that encode data in two dimensions. The primary advantage of 2-D codes is the ability to encode a lot of information in a small space. Barcodes eliminate the possibility of human error. A barcode scan is fast and reliable, and takes infinitely less time than entering data by hand with less possibility of errors. Barcodes are extremely versatile. They can be used for any kind of necessary data collection. This could include pricing or inventory information. Because barcodes can be attached to just about any surface, they can be used to track not only the products themselves, but also outgoing shipments and even equipment. Data obtained through barcodes is available rapidly. Since the information is scanned directly into the central computer, it is ready almost instantaneously.